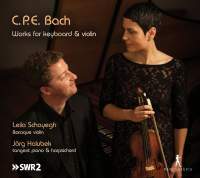 This collection presents C. P. E. Bach at his best. His characteristic and influential leaps in musical logic are well in evidence, from the extended pauses which fracture the closing Allegro siciliano of the B minor Sonata to the capricious progressions of the Fantasie in F sharp minor ‑ a single movement of nearly 14 minutes duration, this is an intriguingly bizarre work and a fine first sampling point for the curious. The other single‑movement work here, the Arioso, by contrast deploys its ideas over longer spans. 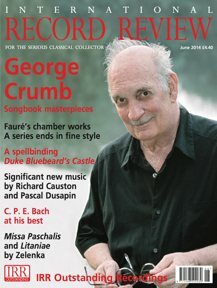 The sonatas themselves reflect C. P. E.'s historical position, taking both the later three‑movement form and (for H502) the four‑movement 'church sonata' form. Jörg Halubek's harpsichord playing embraces a rich legato when required and the instrument used (by Matthias Griewisch) carries warmth of tone right up into the high treble‑melodies ‑ a good thing, as there are many, often in direct dialogue with the violin. The probably still relatively unfamiliar designation 'tangent piano' need not worry the uninitiated too much ‑ there would not be too many listeners who could without prior information distinguish the result from a fortepiano. As captured here the instrument is attractively sonorous and resonant, with several 'alteration' stops (the ‘una corda’ is especially effective) and its own natural reverberation, serving if anything to highlight the daring of some of C. P. E. Bach's progressions. Leila Schayegh's playing does not eschew the occasional generous portamento, above all in the Arioso ‑ how 'authentic' this is (and whether all of them are strictly necessary) I would not presume to speculate but the results for the listener are richly rewarding. Vibrato is generally reserved for the longest notes and is not predictably employed even on them ‑ which of course is as it should be. She manages some quite audacious fade‑outs al niente, sometimes with very close recorded attention, as though she had instructed the engineer to keep her right‑arm technique under the microscope. Her violin is muted in the Arioso as well as in the Adagio from the C minor Sonata. The resulting blend with the harpsichord in the Arioso is a seductive one, allowing the harpsichord's treble to sing above a sombre inner line even when the dynamic increases toward the movement's end. A muted violin in forte combined with a harpsichord is a daily listening experience probably for very few of us and the effect is delectable. The blend of the muted violin with the tangent piano in the Adagio from the C minor Sonata, on the other hand, is like nothing else I have heard either on disc or live. The tangent piano's sonic halo is remarkable enough on its own and the wide‑ranging right‑hand part sets the entire instrument quietly ringing ‑ but Schayegh's first note stealing in out of the piano's resonance I found quite literally breathtaking. It is almost a shame that this jewel comes so late in the disc. If you are vacillating and have the chance to hear the penultimate track, on no account hesitate ‑ although, to be honest, I hear no reason in these 71 minutes why you should hesitate anyway.